Winter is setting in here in Washington, D.C., and I'm pondering why I still live in a cold climate. Meanwhile, my e-mail inbox is filled with enticing offers for cheap travel to exotic, warmer locales  with Las Vegas top among the list. The Las Vegas Convention and Visitors Authority is flooding TV and radio airwaves, as well as cyberspace, with invitations for a wild adventure in the glittering city  after all, "what happens in Vegas, stays in Vegas," they proclaim. However, on your next visit to Sin City, try getting off the strip for a different kind of wild adventure  one a bit more geologic. On your next trip to Las Vegas, consider spending a day, or a week, in the wild natural surroundings of this desert oasis. Photo is courtesy of the Las Vegas News Bureau. No matter which direction you head, you'll find an abundance of hiking, camping and outdoor activities in southern Nevada. Renting a car for a day or a week is generally inexpensive in Las Vegas, but if you prefer, several tour companies offer bus trips to nearby sites with great hiking trails, including Lake Mead, Hoover Dam and Red Rock Canyon (all within 30 minutes or so), as well as farther-away sites such as the Grand Canyon (5.5 hours), Zion National Park (3 hours) and Death Valley (2.5 hours). If hiking isn't quite your thing or you would rather learn about the natural landscape in comfort, several companies also offer helicopter, small-plane and bus tours of the area. The geology of the Las Vegas valley and surrounding landscape lends itself to some great hiking opportunities. The valley itself is a broad sedimentary basin at the southern end of the Basin and Range tectonic province, composed primarily of alluvial deposits weathered out of the mountains that surround the valley. The valley is geographically bounded by the Spring Mountains and Red Rock Canyon to the west, Frenchman Mountain and Lake Mead to the east, the McCullough Range to the south, and the Sheep and Las Vegas ranges to the north. At least eight faults lie beneath the valley. 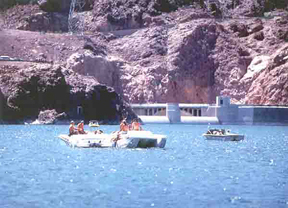 Lake Mead is the product of the 1930s construction of Hoover Dam. The lake holds 9 trillion gallons of water, and boasts 885 kilometers (550 miles) of shoreline. The Lake Mead National Recreation Area is just 30 minutes from downtown Las Vegas. Photo is courtesy of the National Park Service. The Las Vegas valley is a desert environment, receiving little more than 10 centimeters (4 inches) of rainfall a year, though the nearby mountains receive closer to 50 centimeters (20 inches). The mountain runoff into the valley provides some beautiful waterfalls, creeks and springs, and which gave name to the city: "Las Vegas" means "the fertile valley" in Spanish. Perhaps the most popular place to visit outside of downtown Las Vegas is Lake Mead and Hoover Dam. However, on your drive out to the lake, stop by Frenchman Mountain (which you drive through) for a quick hike and interpretive tour to learn about the geology of the mountain and the valley. The Great Unconformity Interpretive Trail is an easy 400-meter (one-quarter of a mile) hike that flags a few interesting rock exposures and explains some of the major topographic features and geologic evolution of southern Nevada. It also points out where 1.7-billion-year-old Precambrian basement rocks are overlain by much younger (500-million-year-old) Tapeats sandstone, giving the trail its name. The trail is a quick little jaunt and provides a nice view of Las Vegas from the overlook at the top. Back in the car heading east, you'll soon reach Lake Mead, a manmade lake formed in 1935 by the erection of Hoover Dam on the Colorado River. When full, the lake holds 9 trillion gallons of water, and is rimmed by 885 kilometers (550 miles) of shoreline. This national recreation area offers boating, waterskiing, swimming, scuba diving, hang gliding, skydiving, fishing and lots of hiking. Stop by the visitors center on the way in to get maps for hiking trails  some of which lead to hot springs  and learn more about the geology of the area. 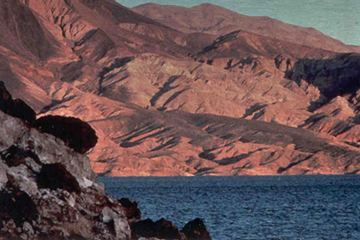 Today, Lake Mead is a recreational haven for hikers, boaters, scuba divers and the like. No visit to the lake is complete though, without a stop by Hoover Dam, once the world's tallest dam. Photo is courtesy of the National Park Service. Lake Mead and the surrounding desert hills tend to be about 10 degrees Fahrenheit warmer than Las Vegas and often host some wild storms, so check out the weather before you visit. But generally throughout November and the rest of winter, you should have perfect hiking weather. Additionally, if you're yearning for some peace and quiet away from the sites and sounds of the strip, campsites, lodges and resorts abound near Lake Mead. A visit to Lake Mead is not complete without touring Hoover Dam, which was once the world's highest dam. The dam itself is 221.4 meters (726.4 feet) high and 201 meters (660 feet) wide at the base. It annually provides 4 billion kilowatt-hours of power to 1.3 million people in California, Arizona and Nevada. Hoover is open for tours from 9 a.m. to 5 p.m. daily, except on Christmas and Thanksgiving, and tours cost $11 a person (less for kids, seniors and active military). Tours take visitors 152 meters (500 feet) down into the dam for a look at the eight power generators, and then back up to an amazing overlook. The self-guided tours are well worth the $11 and include discussions of the geology beneath the dam and the surrounding area. Another popular area to visit is Red Rock Canyon National Conservation Area, on the western edge of Las Vegas valley at the foot of the Spring Mountains. Stop by the visitors center on the way into the park for a map of hiking trails, many of which lead up narrow canyons to waterfalls. The center will also give you a map of the "Scenic Loop," a 20-kilometer one-way road through the park with picnic benches and roadside hikes. The multihued cliffs of these canyons may remind visitors more of Arizona or Utah than of the Nevada desert. 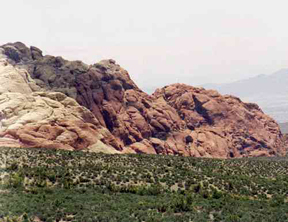 Red Rock Canyon National Conservation Area is another popular hiking spot within 30 minutes of downtown Las Vegas. Photo is courtesy of Recreation.gov. If you're up for more adventure, continue into the Spring Mountains for a hike around towering Mount Charleston, the highest peak in the area. Eighty kilometers of groomed hiking trails lead through narrow canyons to magnificent waterfalls, and many campgrounds offer a break from the city. Heading north from the city, you'll find the Desert National Wildlife Range at the northern boundary of the valley, which is the largest wildlife refuge in the lower 48 states and is home to bighorn sheep, mountain lions, deer and many species of birds, and is a good place to find fossils (but don't take any!). The Valley of Fire State Park, Nevada's first state park, is a little bit farther on toward the east, but offers stunning natural sandstone formations, as well as petroglyphs and other remnants of ancient cultures such as the mysterious Native American Anasazi. It has fewer hiking trails than some of the other parks, but can be a good place to "freelance hike," if you like blazing your own trail. Valley of Fire State Park is Nevada's first state park and is filled with impressive sandstone formations, in addition to petroglyphs and artifacts left by Native Americans. 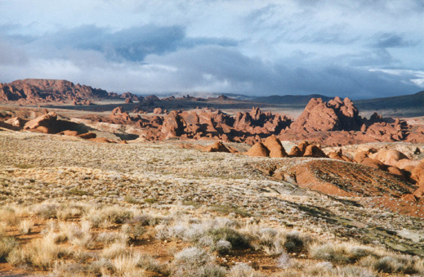 Photo is courtesy of Nevada Division of State Parks. Mild winter temperatures make November a perfect time to visit southern Nevada. And until Christmas and New Years, when the city gets swamped with tourists, hotels, casinos and airlines are all offering amazing travel deals. 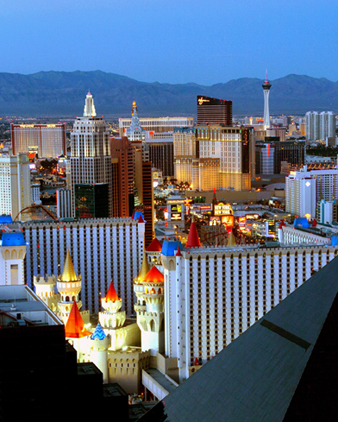 So book a flight into the city, spend the night in a casino and scratch your gambling itch if you must, and then head out on a few day trips for some natural relief from all the glitz and glamour of the strip. Guide to "Las Vegas Outdoors"